Archaeologists have unearthed a 3,500-year-old door to the afterlife from the tomb of a high-ranking Egyptian official near Karnak temple in Luxor, the Egyptian antiquities authority said. The door came from the tomb of User, the chief minister of Queen Hatshepsut, a powerful, long ruling 15th century B.C. queen from the New Kingdom with a famous mortuary temple near Luxor in southern Egypt, The Associated Press reported. 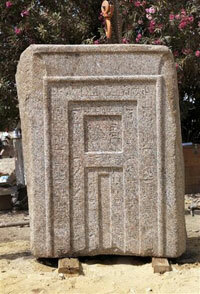 The Ministry of Culture of Egypt said the door, which is made up of red granite, belonged to the tomb of User and his wife Toy. It is suspected that the door was a passage for the spirits who left the human bodies. The Associated Press observed the latest find and said, "False doors were placed in the west walls of tombs and faced offering tables where food and drink were left for the spirit of the deceased." Egypt's Supreme Council of Antiquities (SCA) said in a statement that the findings were discovered in front of Karnak Temple, southern Egypt, during a routine excavation, according to The Money Times. User held the position of vizier for 20 years, also earning the titles of prince and mayor of the city. Viziers in ancient Egypt were powerful officials who oversaw the running of the kingdom's intricate bureaucracy. A chapel of User was also found at Gebel el-Silsila, a mountain quarry site at Aswan, showing the importance of the post of vizier in ancient Egypt, especially during the 18th Dynasty, Discovery News reported.